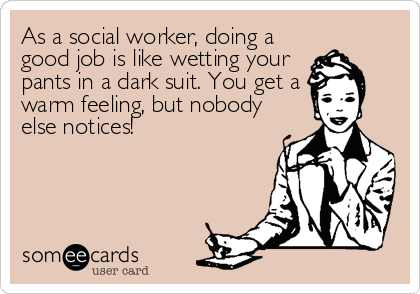 What happens when a therapist needs to be liked, needs to feel like they matter, and/or needs to feel like they are nurturing and the patient does not meet the therapist’s need for such gratification? Often, the work grinds to a halt. The patient gets “busy” with other things. The therapist, suddenly, must cancel multiple appointments. These unconscious resistances on both sides of the couch is the meat of psychoanalytic teaching, and yet, the most challenging concept to grasp in psycho therapeutic work. In other words, the beginning therapist must put aside the layman’s notion that “this work is so gratifying” as the need for that gratification can impose a burden on the patient to say they are well, when, in fact, they are still suffering quietly. The therapist’s unconscious need for affirmation can replicate the patient’s role in his/her family to make sure that their parent is happy, at the expense of knowing their own true self. In this scenario, the patient is not only not getting better, but in fact, is being re-traumatized by the alleged therapeutic situation. Ty, a forty-year old female patient, and Tro, a forty-four year old female beginning therapist start to work together. Ty keeps telling Tro how much she is helping her. Tro reports the gratification is seeing Ty develop and suddenly, after 6 weeks, Ty drops out of therapy, while Tro is aware that Ty remains in a difficult relationship and she has occasional substance abuse issues. Tro is bewildered. On the one hand Ty expressed gratitude at every session, and on the other hand, Ty stopped the work prematurely, according to Tro. “Could it be that Ty unconsciously had to tell you how much you were helping her, because she sensed your need for affirmation, but that deep down, Ty knew that she was not finding her sense of agency, her sense of her own voice?” I say, to my student, to her amazement and somewhat alarm. “You mean that I am letting my own stuff get in the way?” She asks, astutely. “If by stuff, you mean, your need to feel validated by others, then yes, that could be getting in the way of Ty being more authentic. She may feel she has to care for you and make sure that your ego is intact, as she had to do that with her mom.” I respond, pleased that Tro is quickly grasping the concept of counter-transference. “It is hard to be in a field, where positive reinforcement can be a defense,” I say, trying to make light of this challenging topic. “The holy grail of reward is seeing a patient become less defensive, which does not necessarily translate into holiday cards, or presents. In fact, gifts become a complicated subject, layered with meaning, and sometimes, “you guessed it” I say, a defensive act. The patient is crying. The analyst is bored. What is the problem? There is a lack of affective, or emotional, attachment. To say that the patient is split off from his feelings is going to generate “blame the patient” approach to psychotherapy. To say that the analyst is “burnt out” is going to “blame the lousy doctor”. The question, for my students, is how to tell the difference, or determine the gradient where there is some sense of how this discord has come about. Luis, seventy-one, comes to mind. He insists he is not worried about aging, and yet, he frequently reminds me that he is “doing pretty well for a man of my age.” This inconsistency triggers in me a sense of confusion and internal movement. I am not feeling for Luis as a result of my internal sense of being twisted, not in a manipulative way, but in a defensive way. He tells me how hard his life is, given his elderly parents, his sick wife, and his lack of contact with his adult children. I hear his challenges, but his presentation makes me think of lists, and order, and numbers, rather than the stressors of caretaking and the feeling of abandonment. My “diagnosis” if you will, is that Luis has split off his feelings from this words, such that in an unconscious ways, the way he copes is to flatten out his feelings but maintain the verbal narrative which conveys his distress like a shopping list. As I recognize this split, my job becomes to help him stitch together feelings with words, such that he has more compassion, both for himself and for others. The absence of my feelings point me towards his psychological split, and hence I am using my countertransference to help me understand his coping skills. In the case of Luis, the patient sounds bored, and the analyst is confused. The challenge is to help Luis be more engaged with himself, so that other people, in this instance, me, can be more connected to him. This work of engagement will ultimately help Luis deepen his relationships and thereby help him cope with his responsibilities. Luis would tell you that his problem is the external issues of his parents, his wife and his children. I would tell you that a deeper issue for Luis is his need to split off feelings from words, such that he is unable to get nourishment from others. Is there a pipeline from the unconscious of the patient to the unconscious of the therapist? Imagining this pipeline is part of the psychotherapeutic art. “Tell me what I should talk about.” Willa, forty-three, says with, what I perceive to be, a demanding tone. “I am feeling angry right now and I am not sure why,” I respond, suggesting that I am picking up on her anger, but not certain of that. “I do have some self-awareness” Willa says forcefully. “I am confused,” I say, interrupting her, when I should have waited for her to continue. “I do have anger,” she says, as if that should have been obvious to me. “Tell me more about your anger,” I say, not clear as to who or what this feeling is about for her. A dramatic change in tension ensues, where Willa and I begin a comfortable conversation about her husband and her resentment of his behavior. My feeling of anger, I guessed, was a perception which came from Willa’s anger, and yet I had no basis for this assessment, other than my own internal state. Using my feelings, my countertransference, allowed me to unleash Willa’s self-imposed strangulation, of her not allowing herself to be forthcoming about her marital problems. Willa communicated with me through a nonverbal pipeline, which in my early years of work, I would have sat there confused and uncomfortable, instead of harnessing my feelings to deepen our therapeutic work. “Do you get bored?” many friends ask, as if this is the shameful underbelly of psychotherapy. In fact, boredom, a countertransference, is, to use an overused phrase, grist for the therapeutic mill. Boredom is the window into emotional blocking, the common way in which people check out from themselves. Bari, forty-two, starts to give a lot of details about her drive to my office. Her monotonous tone, along with my trying to understand of her need to give me so many details, makes me think about what she is not telling me. “I wonder what is going on here, between us, right now,” I say, gently trying to point her to wonder together as to why she is telling me about her traffic. It is my job to move from boredom to engagement by helping Bari see her avoidance of something that is really bothering her. Eventually Bari gets to her fight with her teenage daughter, but the shame involved in that altercation, sheds light on why her driving difficulties was an easier, less emotional, topic. Lolly, twenty-six, goes on for a long time about how her wedding plans are going. Although interesting at first, over time, my mind wonders, leading me to believe that there is some underlying emotion that Lolly is dodging. Once again, tracing my mind leaving Lolly, I have a clue, a suggestion, that maybe Lolly’s mind also left Lolly, such that she is talking, but not really caring, or feeling anything about what she is saying. Emotional connection is never boring, such that losing interest is a sign of emotional distance. So, yes, I get bored, and then I wonder how to latch back on to that privileged space of shared feelings. 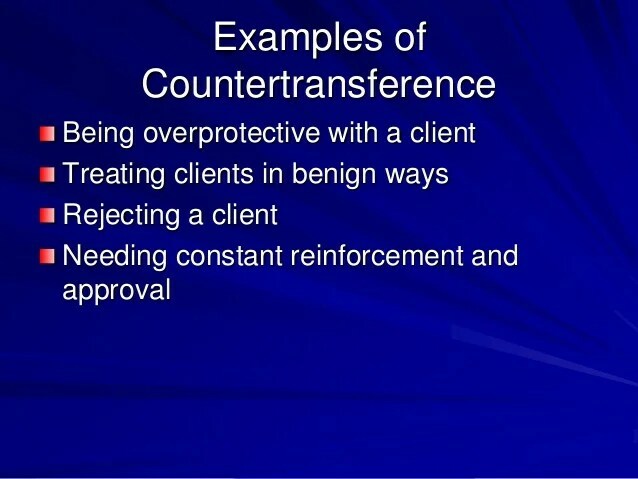 Countertransference is the notion that therapists bring unconscious issues into the treatment. Duh. 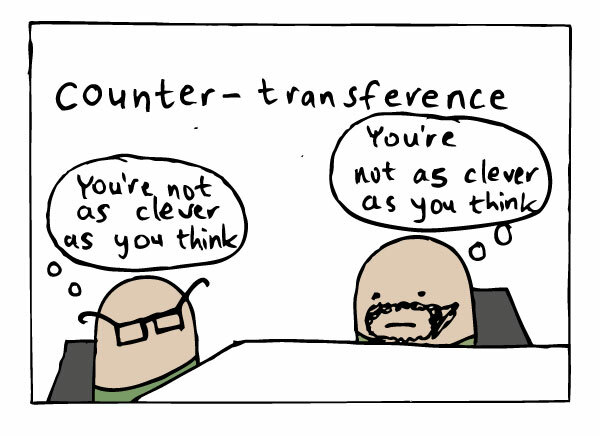 Is it counter to the transference? No, I say. Hence I am not content with the terminology. Sure, therapists have an unconscious which can provide an obstacle to nonjudgmental listening. Somehow, the analytic literature suggests that countertransference was “discovered” in the 1950’s, after WWII. This was the era when many European analysts fled to the United States. Is this a coincidence or related? I am not sure. During this era there were numerous papers written on the bi-directionality of the dynamics. The therapeutic dyad was, in fact, a dyad. Patient and therapist change in the process-just like every relationship. This seems so obvious to us now, but apparently, in the earlier days of psychoanalysis, this was seen as a “discovery”. Yes, maybe I look back not appreciating the development of our field, that hindsight is 20:20, but I still maintain that sometimes the obvious is over-stated.